and this is what I cooked: Monday Mayhem! I had considered making a Yabby Meat Linguine, similar to my vongole/shellfish standard. As for the heart of palm, maybe a modified Caprese? Or just eat it all in a big palm heart splurge? Or a Heart of Palm Cous Cous? Hmm, I really like cous cous and I haven't had it in an awfully long time... and I'd just bought a nice new set of stock jellies to try (one little one makes 2 cups' worth, which is perfect!). Let's do this! If you want to know how long it takes, start making this with the start of Bargain Hunt on the telly in the background. You should be done well before the ad break that comes just before the auctions. Convenient timing, I ate my dinner in front of the suspense filled scenes. So first things first, as above I just boil water in the kettle to pour with cous cous in a 1:1 ratio. For this one, pour out two cups' worth of water to mix up your stock jelly cube. 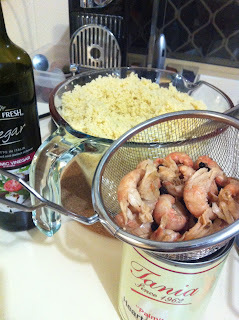 Add two cups of cous cous, and stir/fluff with a fork to avoid play-doh clumps forming. Set by the stove and completely forget about it. So I had never really handled these palm heart do-dads, so in case you are the same, here's a pic of how they come out of the tin. They didn't have a very strong fragrance in the brine, so I just sliced them up and hoped for the best. Then I decided to go for a blend of the following vegies - thinly sliced zucchini strips, halved mini-Roma tomatoes, a diced 3/4 of a red onion plus the grated zest and juice of half a lemon - fresh off the tree from the front yard! Herbs and spices were a bit of a fun blend - dried mixed herbs from the spice rack, cracked black pepper, powdered cumin and powdered garlic. Then I braced myself against the cold night air to grab a handful of chives which I then snipped up with scissors. 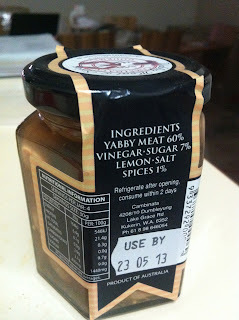 Then I drained the yabbies, but left in the spices that they came with. The boxes arrived today from my East coast place, but I was not going to dig out the Circulon casserole dish and so here we are again, cooking inappropriate dishes in a wok. I fried up the onion and zucchini slices in a generous splash of olive oil, with a single slurp of balsamic vinegar and all the dried herbs and spices. Then the yabby meat Then I added the tomato, lemon zest & juice and then used a garlic press to add a couple of cloves of happy goodness. 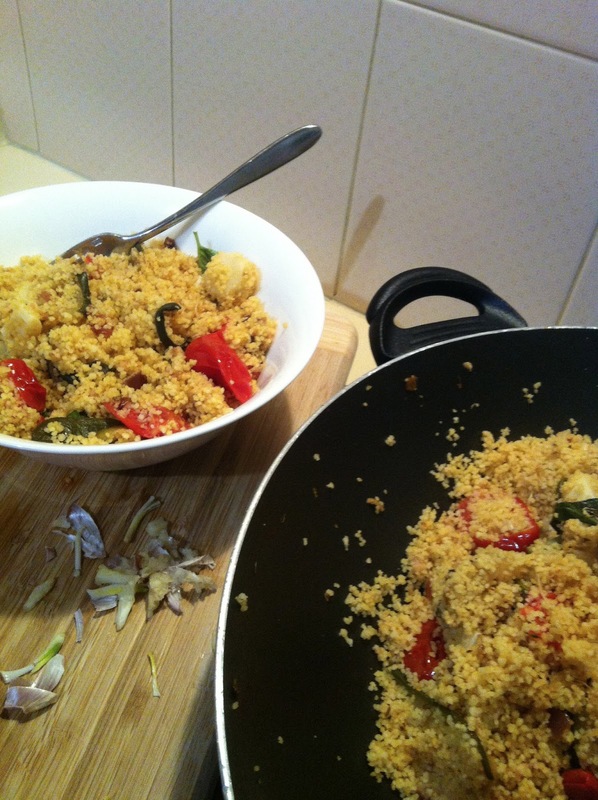 Then in with the palm hearts, then using the fork for maximal fluffiness, the cous cous in small amounts with vigorous stirring in between. Heat off and away we go with a bowlful of warm salad to go and see what Tim Wonnacott has to say about stately homes and the fripperies of royal visits. Oh you saucy minx! Delicious.